SW4 Festival Switcher, PA & Live Sound Accessory from Radial Engineering. 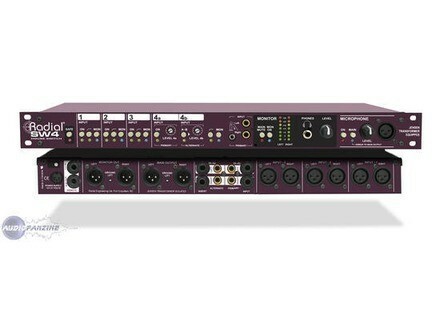 Radial Engineering announced the Radial SW4 Festival Switcher. This 19" rackmount device is designed to allow several mixing consoles, a CD player, a stereo recorder, an i-Pod and a microphone to share the same PA system. The Radial SW4 is said to feature three 'hardwired' stereo input sets that are selected via front panel selector switches. These control a series of air-sealed gold contact relays. A safety button requires two-hand operation to eliminate switching errors and each relay is duplicated for redundant backup thus ensuring the show will go on. Should power be disconnected, the SW4 will revert to 'default mode' with input-1 connected to output-A. The only 'electronics' in between the input and output are two nickel core JT-11BMCF transformers. These are capable of handling +28dB from 20Hz to 20kHz, according to Radial. Lab Gruppen Acquires Lake Brand & Tech Swedish professional audio equipment designer and manufacturer Lab.gruppen has announced its acquisition of the [/b]Lake[/b] trademarks, and the exclusive rights for use of Dolby® Lake® Processor (DLP) technology from Dolby Laboratories, Inc.
DAS Releases LX-218 Subwoofers DAS Audio has launched a new bass-reflex subwoofer system with two 18-inch speakers, available in 3 versions. Alcons Audio Releases CR1 The CR1 is a 3-way sound system, designed to provide medium output, cinema and A/V sound reproduction.